We sell a wide selection of Bryant air filters and the best Carrier air filters for AC units and furnaces. We have air filters with a range of MERV (Minimum Efficiency Reporting Value) ratings with options for expandable and box media filters able to remove dust and harmful particulates from your home or office. 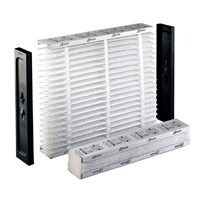 We have Bryant AC filters and Carrier filter sizes able to fit all types of units with the ability to eliminate a range of harmful airborne pollutants. Regularly changing your Carrier air filters will help reduce strain on your AC unit and keep the air in your home or office as clean as possible. Don’t settle for imitation air filters. We carry the highest quality replacement Carrier air filters and Bryant air filters with the most competitive prices and fast shipping on all orders. We are your one-stop shop for all of your air filter needs and strive make air filter replacement a fast and simple process. So, buy online today to take advantage our great deals.